Laurent Bolognini studied photography to finally end up working with light and motors. His research follows in the footsteps of kinetic and light artistic practices that emerged in the 1960s. His works, though often similar, are actually quite different from one another. Sometimes they seem to represent infinite particles; other times they seem to evoke distant stars. Thanks to the motors’ extreme speed, these sketches leave an imprint on our retinas. Bolognini’s shows emerge from the darkness, playing on the limits of our vision, of its relative imperfection, which has always benefited filmmakers. Light convolutions are just as smooth as coils of electrons or moons. These are little laboratory experiments that the artist carries out in gallery or museum spaces, between art and the sciences. Because if digital art is a trend, it’s also a component of the core relationship between art and science that was already taking shape in the Florentine humanistic currents of the Renaissance. Laurent Bolognini was born in Saint Germain en Laye (France) in 1959. After studies at the “Societé Française de Photographie,” he launched his career as a light designer from 1990 onward. He conceived and realized his first “Galiléographe” in 1998. The device was meant to generate a luminous backdrop for Berlioz Benvenuto Cellini, a concept he created in partnership with Francoise Henry during their collaboration as a group “Les Alternateurs Volants” (1998-2006). His “Galiléographe #1” was exhibited at the “Espace Electra”, rue Récamier, Paris, in 1999. The year 2000 was the starting point of a long adventure, involving two different types of partnerships, some being the interweaving of his plastic work with the performing arts, the other with the musical world. The outcome of this approach was to become the substance of further exhibitions and performances. “Illumination” exemplifies the transition from the performing arts to the plastic arts per se. A composition by Frederic Costa was at the core of “Galiléographe #1”, a light and sound performance. 2001 : Laurent Bolognini designed the “Olympia” Galiléographie, a luminous backdrop for The Tales of Hoffmann, staged by Olivier Py at the Geneva Grand Théâtre. The artist also cooperated with musical circles, providing light installations for improvised concerts. Such as the festival “Musique Démesurée” presented at the Clermont-Ferrand Opera, or still the Metz Arsenal for a concert entitled “Antre Ciel” (Celestial Den). There, his luminous designs created a light environment in tune with compositions by Grisey, Xenakis, d’Adamo, Narboni, Matalon. In Great-Britain, he worked together with the Arcanes Quatuor, both in London and Cambridge. While regularly exhibiting in art galleries, Bolognini was several times offered to share in artistic events of importance, such as the Venice Architecture Biennal, the Paris Nuits Blanches or the Cassel Nuit des Musées. 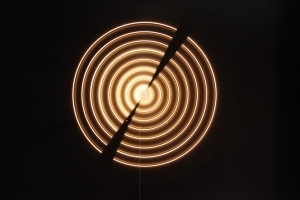 “Electra” — his kinetic light work — has recently entered the MAC/VAL Museum (France) permanent collections, as well as “F-Vecteur” and “Variations #2” the Borusan Contemporary Museum in Istanbul, Turkey.